Sidney Hillman was born in Zagare, Lithuania, on March 22, 1887. His father Samuel, a merchant, focused on his religious studies and left the support of the family to his mother, Judith Paiken, who ran the family grocery. Young Sidney emulated his father and entered the Jewish seminary at Kovno, only to abandon rabbinical studies after a year to study economics and organize typesetters for the illegal Jewish trade union movement, the Bund. Hillman, who had been arrested twice for his labor activities, left the country after the 1905 revolution failed, immigrating first to England and, in 1907, arriving in the United States. Settling in Chicago, he worked as a stock clerk and apprenticed as a tailor, working fifty-four hours a week in deplorable conditions. When a dozen women garment workers struck, he joined the walkout, helped convince management to accept the union, and served as the business agent of Local 39 of the United Garment Workers of America until he moved to New York in 1914. When immigrant members of his old union were barred from attending meetings, they formed the Amalgamated Clothing Workers of America and asked Hillman to return to lead it. He returned saying, "The tailors made me. They can have me." The ACWA flourished under Hillman's leadership, organizing eighty-five percent of garment workers, enrolling 177,000 members, and forcing a standard forty-four-hour work week. Hillman responded to the economic severity of the Great Depression by trying to work with the government. His strong support of the New Deal earned him a place on the Labor Advisory Board of the National Recovery Administration in 1933 and on the National Industrial Recovery Board in 1934. These appointments convinced Hillman that the AFL's concentration on skilled workers was a detriment to the labor movement. He then joined with AFL's rebels to force a vote on widening AFL membership to include workers engaged in mass production of goods. When this vote failed, Hillman joined with John L. Lewis to organize the Congress of Industrial Organizations in 1935, which quickly elected him vice-president. Continuing his intense support of FDR, Hillman helped establish Labor's Non-Partisan League and the American Labor Party to support FDR's 1936 campaign. 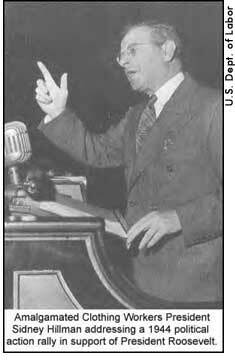 In 1940, FDR appointed him labor representative to the National Defense Advisory Commission and associate director general of the Office of Production Management. By mid-1942, union leaders criticized him for his reluctance to confront business and he unjustly bore the brunt of a procurement scandal. FDR eased him out of the administration. In 1943, he organized the CIO-Political Action Committee to support FDR's 1944 campaign and in 1945, he helped create the World Federation of Trade Unions. His devotion to FDR created one of the most pronounced rumors of the 1944 campaign – in which FDR was alleged to have to made key decisions by saying "clear it with Sydney." Hillman was also equally devoted to ER and had great respect for her political skills, urging her the week after FDR's death to take Hillman's place as director of the CIO-PAC. He died July 10, 1946, after a series of heart attacks. Black, Allida. Casting Her Own Shadow: Eleanor Roosevelt and the Shaping of Postwar Liberalism. New York: Columbia University Press, 1996, 67. The Concise Dictionary of American Biography. 5th ed. New York: Charles Scribner's Sons, 1997, 554. Lash, Joseph. Eleanor and Franklin. New York: W.W. Norton & Company, 1971, 532-534.